Multi-tip powered wheelie bin tippers available from Sitecraft provide an economical and efficient solution to bin tipping requirements in locations where bins are emptied in high volume. Suitable for application in schools, councils and factories, the powered wheelie bin tippers are designed for effortless operation with the operator simply wheeling the bin into the tipping cradle and then taking the machine through its tipping cycle at the push of a button. Multi-tip powered wheelie bin tippers are battery powered with an 18A/HR sealed battery and a high quality built-in float charger. Up to 5 tons of rubbish can be emptied on a full charge of battery. 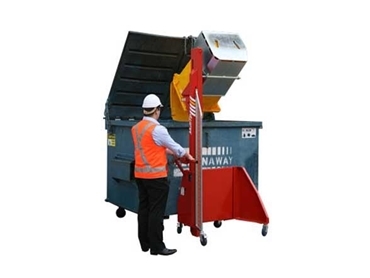 The wheelie bin tippers are available in a capacity of 150kg.